Red Copper Square As Seen On Tv is a square pan which is made up of new technology that offers better results. This pan gives its users with a stick-free cooking experience. With deeper sides, it also means that users can cook thicker meals all in the same pan. Let’s check our Red copper square reviews to learn more about this product in the post below. Buying this pan you will get a free frying basket as well as a steamer tray for vegetables. The product comes with lifetime guarantee. Red Copper Square is made of super strong copper,ultra-tough ceramic, along with an aluminum bottom which is used for even heating. You can use Square Pan as a skillet, fryer, roaster, and baking pan—you can even use it as a deep fryer. The pan is very lightweight but it is amazingly strong which makes it more durable. Using any cooking-stick inside of it to move food around, you won’t need to scratch it or chip it. This eliminates the risk of pan particles getting mixed into your food. 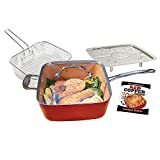 You can use this single cookware to bake foods in the oven, to roast your turkey dinners, to fry foods in the skillet, and much more. When you are done with your cooking you can place the pan in the dishwasher and it will be clean easily. Its manufacturer company claims that no foods will stick to the pan all foods you make will come out. It is safe to use it in the oven. It can withstand temperature up to 500 degrees. Does not matter where you use it though. And the pan is PTFE and PFOA safe so no need to worry about your health. How Copper Square Pan Works? Like similar copper pans, the Square Pan heats up quickly and evenly across the bottom of the pan so that cooking wait time is reduced. Also, it takes very less time to cool down after cooking is done. Everything you can place in one pan or cooked all at once too. The design is infused with 100% copper which is guaranteed to never scratch no matter what types of cookware you are using on it. Red Copper Square As Seen On Tv is designed with anti-scratch technology, You can even use electric beaters to mix foods or beat eggs perfectly in the pan. Hence reduced the preparation work which needed to prepare foods. The bottom of Copper Square Pan is designed with aluminum rings. However, aluminum rings help to provide even heating across the bottom. Copper Chef Pan is almost very similar to square copper pan having similar features, price points, and pros. But, this Square pan design is the only one where you will get all of the additional components such as the frying basket. Whenever you want to fry your food, just place it on the stovetop and let it heat up. With the non-stick technology, the company claims that there is no need to use oils or butter before frying. If you want to bake something or prepare it in the oven, just place the foods inside the pan and put it in the oven for the baking process. DURABLE ROUND FRYING PAN: The 10 inch Copper Chef skillet with glass lid is made of aluminum and non-stick ceramic material. The quality core provides high durability so that the saute pan can be used for extended periods of cook time. The non stick surface is very slick, so food doesn't stick while cooking steaks, broiling fish, frying meat, bacon, eggs, omelets, bake chicken, desserts, or whip cream. HEALTHY SAFE, ECO-FRIENDLY MATERIALS: The CeramiTech coating in this stir pan is healthier because it requires less oil or fat while cooking. An ideal choice for healthy cooking everyday. It is PTFE, PFOA, PFOS and cadmium free coated, which means it doesn't contain toxic chemicals, so they are safe for kids and for adults alike. The cookware wont leach harmful chemicals into your food. FEATURES: You may find you do not need to cook with the same high temperatures that ordinary pots require. That is because the 10-inch fry saute pan with lids has an innovative, stainless steel induction plate built directly into the saucepan. It distributes high heat quickly and evenly to the entire cooking surface to perfect your steak, egg, vegetables, omelette, pancake or anything you are craving for. Cleaning is hassle free since the griddle pan is 100% dishwasher safe. OVEN SAFE: The nonstick ceramic skillets is heat resistant up to 850 F. Allowing transition from stovetop to oven in one pan. Sear a pork chop on your stovetop, then bake to your desired degree of doneness, all from the same pan. Sturdy helper handle on 10inch pan makes transporting your pot a cinch! Less cook time, less mess. The ergonomically shaped metal handles on the pan may become hot, so always exercise caution when using. NON-STICK BOTTOM: The 10" frypan is coated and will not oxidize, or tarnish like traditional copper pans that need frequent polishing. The saucepan can be used on an open fire, electric induction and grill. There is no need to add extra butter, grease, or oil. For added flavor, season the cooking surface with natural oils such as olive, canola, or peanut oil. Red Copper Square Pan got mixed reviews from its users. But I’m a fan of the Red Copper Square pans. It is working better than any pans I’ve tried till now. Food does not stick. Pan doesn’t get scratch and also dishwasher safe.And due to its square shape, it can store a more cooking item in it. It will be really interesting to see the durability of the pan. If you are also using this pan please do share your experience in our comment section. I hope our Red Copper Square Reviews 2019 will help you to understand more about this product. If you want to know more about this product check customer’s Red Copper Square reviews on Amazon. You can use Red Copper square Pan for cooking anything. The product is efficient and also safe for healthy cooking. The price of the product is bit high, but apart from that product is really worth buying.